Several resources about tsunamis are available from the SERC websites. Below is a list of project websites that provide visualizations, teaching activities, and tools that may be of use in the classroom or in lab. 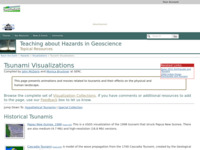 Click the images above to browse teaching activities and course descriptions related to tsunamis. Collections are contributed by faculty and may include service learning projects, writing assignments, field trips, course descriptions and syllabi. 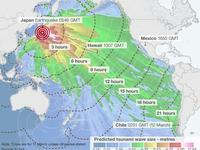 2011 Japan Earthquake and Tsunami event page - This web page provides links to visualizations, news articles and videos, and teaching activities and materials related to the 2011 tsunami and earthquake in Japan. Tsunami Visualization Collection - This collection of visualizations includes animations, photos, and models of the 2011 Japan tsunami, 2004 Indian Ocean tsunami, other historical tsunamis, and hypothetical tsunami models. 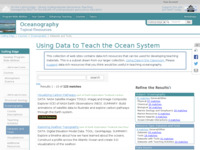 Using Data to Teach the Ocean System Datasets and Tools - This collection of web sites contains data-rich resources that can be used for developing teaching materials. This is a subset drawn from our larger collection, Using Data in the Classroom. A browsable list of approximately 40 internet resources each with a short summary is also available and can be further narrowed down by subject, ocean environment, or resource type. 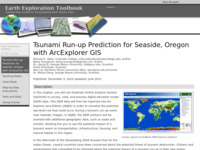 Tsunami Run-up Prediction for Seaside, Oregon with ArcExplorer GIS - This Earth Exploration Toolbook chapter has students investigate the 2004 Indian Ocean tsunami using real data. This chapter of the Earth Exploration Toolbook is also available using My World GIS. 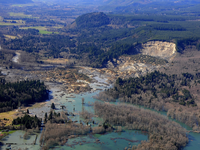 Tsunami Related Activities from On the Cutting Edge - This collection of over 20 activities and problem sets features tsunamis. Some activities involve students using real data and tools such as GIS and remote sensing to investigate tsunamis. 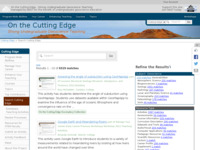 On the Cutting Edge: Teaching about Hazards in Geoscience - Major hazardous events and natural disasters provide powerful opportunities to engage students with class content and demonstrate how the geosciences impact everyday lives. This module provides resources, including visualizations, articles, teaching activities, and advice for effectively teaching about hazards. Resources for particular events, including Hurricane Sandy 2012, the 2011 earthquake and tsunami in Japan, the 2010 Deep Horizon oil spill, and 1906 San Francisco earthquake, and several others, recent and historic are also available.